“I believe that planting these trees is necessary not only in biospheric terms, that is to say, in the context of matter and ecology, but in that it will raise ecological consciousness — raise it increasingly in the course of the years to come, because we shall never stop planting.” — Joseph Beuys, 1982. 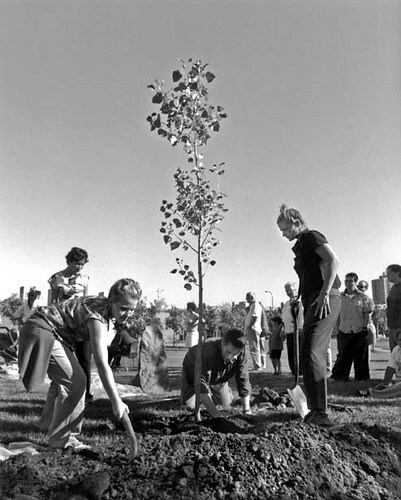 People plant one of 7,000 trees in Cass Lake, Minnesota as part of 7,000 Oaks, Minnesota in 1997. The Minnesota project was modeled after the original 7,000 Oaks project in Kassel, Germany. Photo from the Walker Art Center / Minneapolis Sculpture Garden website. I am researching two American adaptations (in Baltimore, Maryland and Cass Lake, Minnesota) of German artist Joseph Beuys‘ installation and urban revitalization project, The 7000 Oaks, for my masters thesis in City and Regional Planning and Landscape Architecture at Cornell University. The 7000 Oaks began as an installation and ‘performance’ at Documenta 7 in 1982. Documenta is an exposition of current trends and experimentation of art that takes place every five years in Kassel, Germany. Beuys’ project, which involved planting 7,000 trees in Kassel, took five years to complete. Volunteers, neighborhood residents, students and city officials engaged in the physical act of planting trees throughout the city. Called an act of ‘social sculpture’ by the artist, the project also included local districts and citizen groups in the decision-making process of how and where the trees would be planted and how they should be maintained. This generated dialogue on expected impacts regarding community development, city planning and the project’s long-term stewardship. 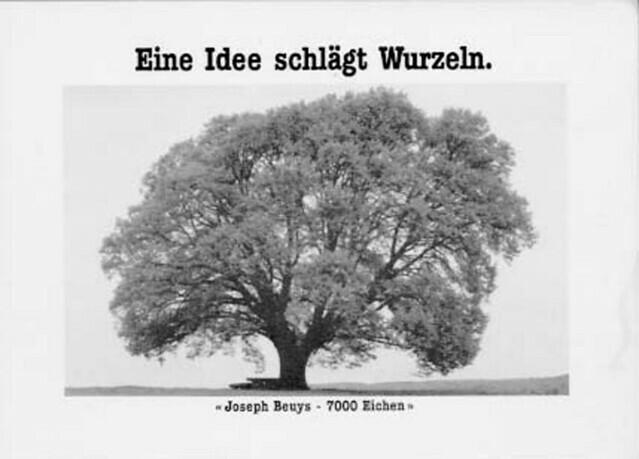 Eine Idee schlägt Wurzeln (An Idea Takes Root), by Joseph Beuys. The postcard above was for his 7000 Eichen/7000 Oaks project. The 7000 Oaks in Kassel was completed by the opening of Documenta 8 in 1987. 7,000 trees transformed the once industrial and hardscaped urban environment. Cities elsewhere tried to replicate this project, focusing on the promise of civic engagement and learning. As Beuys stated in 1982, “I believe that planting these trees is necessary not only in biospheric terms, that is to say, in the context of matter and ecology, but in that it will raise ecological consciousness — raise it increasingly in the course of the years to come, because we shall never stop planting.” Sadly, he died before the Kassel project was realized, and it was his son who planted the last tree. However, by 1995 major initiatives, three in the United States, were underway posthumously. Led by artists and curators, and facilitated by major cultural institutions, these projects claimed to embody the integrity of the artist and to employ the community in the future of its design. 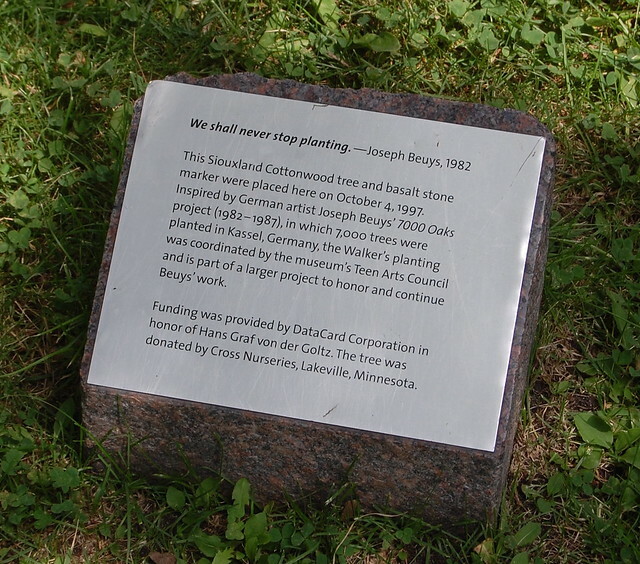 A plaque marking the Minnesota project. Photo by 16 Miles of String on Flickr. In 2009 two scholars at the University of Kassel, Dr. Stefan Koerner and Florian Bellin-Harder, published a report exploring the Kassel project 25 years later in the Journal of Landscape Architecture – testing the measure of success one generation removed from the initial installation. The study cited the city’s absorption of the project by the early 1990’s and a development of hierarchy for the care and maintenance unfolded. Community stewardship had been abandoned, and the more impoverished areas saw severe neglect. This report provided the framework for my study of the two American cities that tried to replicate The 7000 Oaks: Baltimore and Minneapolis. Do these projects share the same outcomes? If not, how and why are they different? This semester I am embarking on an exhaustive study to answer these questions involving field work and research taking me to Baltimore, Minneapolis, Cass Lake, and Kassel. Broadly, I aim to explore the role of public art, urban ecology, community engagement and long-term stewardship of cultural landscapes in urban settings. My thesis is titled: The Art of Urban Nature – Curating the City with the Work of Joseph Beuys. I will visit the two cities with the Beuys progeny; peruse archives at the host institutions, the Walker Art Center in Minneapolis and the Center for Art, Design and Visual Culture in Baltimore; and interview the originators and participants of these projects. I will conduct an inventory and analysis of the trees, develop a better understanding of the physical and social contexts for the works, and review the maintenance plans of the projects over the last 15 years. I will be in residence at Dumbarton Oaks, a research library and collection in Washington, D.C., for a short-term pre-doctoral residency in early March. I will travel to Germany in April to view the original Beuys installation and share my research with Koerner and Bellin-Harder. As The 7000 Oaks was a form of ‘Social Sculpture,’ I see this blog and the concept of documenting my process with public review as a manifestation of that mission. Baltimore, MD UMBC Beuys Tree Planting Partnership, 2001.